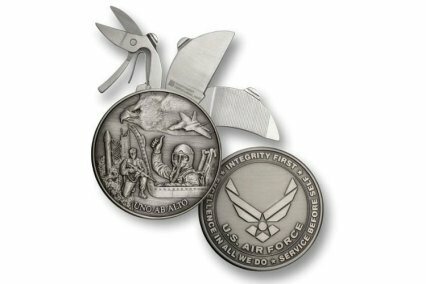 The ultimate combination of form and function, this richly detailed coin knife serves as a durable and highly practical tribute to all Air Force personnel. It features tough, stainless steel blades, which fold neatly into the uniquely designed, die-struck coin handle. Minted on the obverse is a striking montage commemorating the awesome power and proud heritage of the world's most fearsome aviation force. The reverse bears the official Air Force emblem. Struck in a nickel alloy, the knife handle is coated in an antique finish.